I accepted the invitation to be on the Willing and Abel Medical Board. I will be one of a team of medics who will review potential cases from various countries for surgery and make medical recommendations to the W&A trustees. 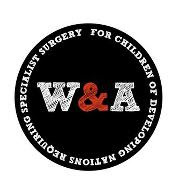 I'm excited to be a part of W&A more formally and to continue helping children in developing countries who require specialist surgery. I see a number of children at the hospital that struggle to get the surgery they need and it's great to know that W&A can help. Children that I have helped with the assistance of W&A to date are children like Namina (cancrum oris, needing multiple reconstructive surgeries on the Mercy Ship), Junior (cleft lip and palate) and some of the hydrocephalus cases I sent to Guinea for shunting. Up until now, I've been able to take most of the children to the Africa Mercy for surgery and so the costs have mainly been related to border crossings, documentation for the vehicle, transport costs, food, etc. With the Africa Mercy going to Congo for the next outreach, I may need to look at other options. Praying that God will direct. Junior will need a palate repair towards the end of the year/early next year and I have two new cleft lip/palate cases needing surgery. In the meantime things remain busy with my Welbodi Partnership work at the Children's Hospital and I'm still on the Enable the Children Board of Trustees. Enough to do!